This is another 1840’s print from a Natural History book in my collection. This one shows some Flying Bats, with a Castle scene in the background. You may recall a similar print from HERE. I think the two of them would look great framed together, for Halloween! 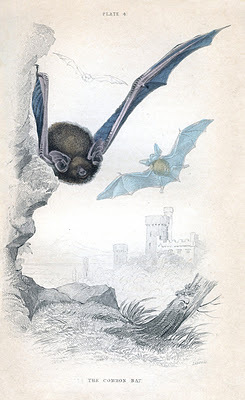 Vintage Flying Bat Illustration! Vintage Sleeping Bat Image! 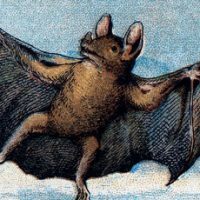 Vintage Flying Bat Image – Halloween! I am having a Halloween decorating party today…definitely will find a place for this! Thank you so much for all the wonderful art! These bats are fabulous.